On July 5, 2016, my Galaxy Photographer’s Planner and Handbook finally arrived, after the Kickstarter campaign was funded on Dec. 24, 2015. Here’s my first look. Galaxy sprang into the analog photography scene in the fall of 2015 and has already made quite a splash. Their Hyper Speed Direct Positive Paper was funded in September and started shipping to backers before the end of the year. The response so far has been largely positive (no pun intended — really! ), though there was some early criticism that the reversal development method required wasn’t adequately explained. This paper is an attempt (a successful one, from what I’ve seen so far) to revive a paper type that was discontinued by Kodak in the 1970s. With the success of the sheet version of Hyper Speed paper, they also recently proposed a version of the paper rolled on 120 film spools for medium format cameras, which was just funded a few weeks ago. They’ve also got current campaigns for dry plates and plate holders. The plates have already met their funding criteria. Shortly after the original positive paper was funded, they launched the campaign for the Photographer’s Planner and Handbook, and launched a website called dark-room.org. The site appears to basically be a forum, but it has not taken hold in the community at all, despite a simple design and straightforward purpose. The papers and plates haven’t captured my imagination, but the Planner definitely did — I went ahead and funded it about the same time I funded Let’s Explore Magazine. I actually got a bit disillusioned with the whole Kickstarter thing during the long wait. I told myself I should’ve known better after all the high-profile delays and failures of other photographic campaigns, such as the much-delayed Travelwide 4×5 camera and New55 instant film. 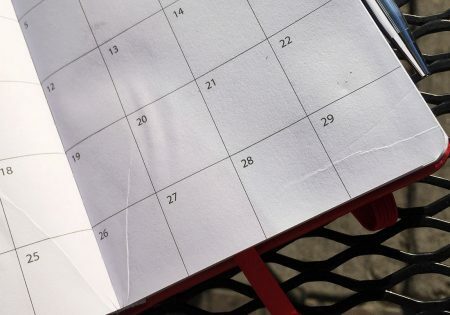 Delays should not be unexpected with crowdfunding campaigns these days, but honestly, my single biggest complaint with the Planner has been the long wait and a relative lack of communication about the reasons and resolutions. The estimated shipping date was January 2016, but delays with the China-based printer piled up over and again, according to project updates from the company. 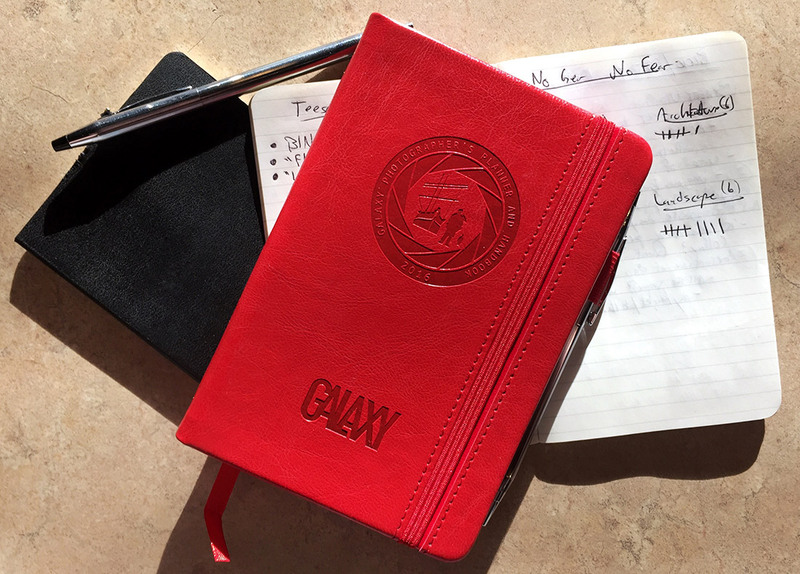 I got the red Planner (obvious from the photos, no doubt — black was also available) and the first thing I noticed upon opening it was the rich feel of the leather, and the nice embossing and attention to detail. The elastic closure strap that wraps around the front cover fits into a nicely stitched channel which lends a sleek profile to the book when closed, and there’s a nice page-marker ribbon and an elastic pen holder that fits my Cross Century pen perfectly. The cover material is firm but flexible, but not totally hard, so it’s comfortable to hold and will probably mold itself to whatever pocket it’s kept in. It’s still more than stiff enough to write on solidly while holding the book in your hand. Inside, past the title and copyright pages, is an “If found, please return to…” page with enough room for a name, telephone number and more (I added my Twitter handle there, just in case). I noted at this point that the paper is a little on the thin side, and feels kind of soft. Writing my contact information on the first page left visible impressions on the following two pages, though the pen loves the paper and writes very smoothly upon it. Curious about the printing and paper quality, I allowed a few drops of coffee to fall on the pages of the preface. It stayed beaded up and didn’t soak in too quickly, and allowed me to brush it away without smearing the ink. I let one drop sit for a full minute and it barely soaked in at all. When I blotted it off with a napkin, the ink was very slightly faded, but had not run appreciably and remained very legible. The preface discusses the history of the idea and design, and does a little work to sell the book. In future editions, I’d hope to see the history in a more condensed format that fits on a single page (front and back would by okay) rather than taking three leaves. 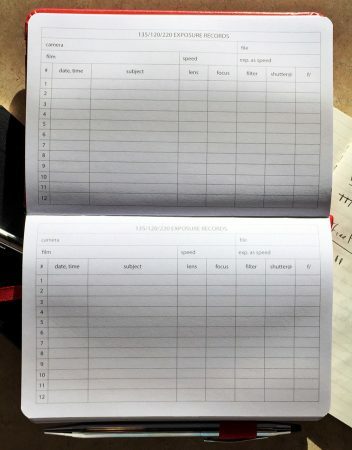 After the preface, the calendar section begins with a page of quick-reference calendars for 2016, 2017 and 2018, before the Important Dates subsection. The selection of dates considered important seems rather arbitrary, including major awards competitions like Pictures of the Year International and much smaller shows such as the Tallahassee International juried competition, as well as a few conventions and expositions in the photo world. Very little of what’s listed is limited to film photography, or even very inclusive of it, and it seems like a much better selection of relevant events could’ve been researched. Additionally, the formatting of the information provided isn’t very consistent, and a few of the descriptions need some copy editing. Lastly, 14 of the 18 listed events have already passed (or, at least, the entry deadlines have) as of the day I received my Planner. The Monthly Planner section has a two-page spread dedicated to each month of 2016 and 2017 (so at least the 2016 edition is good for more than just the next five and three quarters months). They’re nicely designed and look like they will be quite useful. A few of them were stuck together with little globs of what looked like gum, and several are strangely creased (though not in a way that precludes using them). The next section is Zone System records. It dedicates a dozen pages to explaining the Zone System before providing 20 pages of Ansel Adams’ Zone System exposure records. Since I do not use the Zone System often (or really do much with large format at all), I don’t really have a good frame of reference to determine if this is enough record pages to be useful. Each record takes two pages. 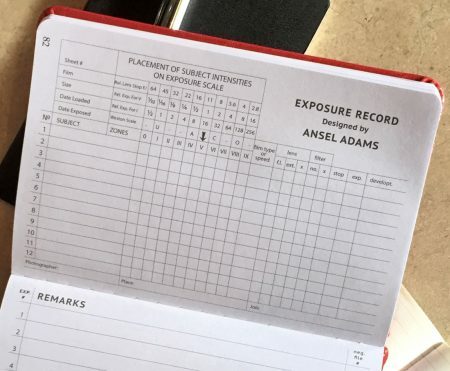 Next up are 20 pages of Large Format Exposure Records, each one a full page with spaces for camera, film holder, emulsion, subject, etc. Again, I have no real frame of reference for how useful these are, nor if there are enough to last a year, or a month, or whatever. These last two chapters (and the next few) begin with nicely designed chapter title pages featuring gargoyle heads and unicorns from the early-twentieth-century photographers’ planners that inspired this project, but other sections are missing these cues. The title pages, when present, have photographs on the left-hand facing pages, though they are all rotated 90 degrees, which looks a little weird next to the vertically-aligned title pages. I feel like the design inconsistencies are likely the result of rushed production since this project was posted, funded and sent for production in rather short order. I hope these issues are addressed in the next edition. 135/120/220 records pages begin after the next section title page, and are single-page lists with space for a single roll of film and up to 12 exposures. Once again, there are 20 pages here, which will equate to 20 rolls of 6×7 (10 frames per roll and two lines unused or repurposed for additional notes). I can say with certainty that this is nowhere near enough for a year of shooting for me. Or even a month, probably. If I used this book religiously for each roll of film for just my one current ongoing project, I would exhaust all the pages in just 3-4 days’ worth of photographing. My biggest suggestion for next year: break this into multiple editions — at least one completely dedicated to roll film users. Give me 100 or even 150 pages of these records, and throw in the Monthly Planner and Location Scouting (more below) sections, and some lined pages for project ideas and notes, and I would be set. Next up are the In-Camera Medium Processing Record pages, which are introduced with a title page, but come with no explanation. There are 20 pages of these records with five to a page, and each offers spaces for project, date, media type, process/chemistry, push/pull, time and notes. Are these just film developing notes? Did they use the word “medium” because it could be direct positive paper, glass dry plates, wet plate collodion, or Film Washi paper? Following these enigmatic records are 20 pages of “Darkroom (print) Records.” Did they put “print” in parentheses because they think people interested in film photography planners could possibly not know that prints and darkrooms are kind of made for each other? Three records to a page here, with most of the same form fields as the Medium Processing pages, plus size, aperture, and exposure time, as well as color enlarger settings slots. The Location Scouting Records section that comes next was one of the things mentioned in the Kickstarter campaign that seemed like a brilliant addition to me. I can’t even guarantee I’ll be using them, but I really hope I do. There are so many places I’ve thought to myself that I really should go back and photograph with different equipment or at a different time of day, or even just at some point in the future when I’m not doing whatever I’m doing when I notice them. If I kept a good record of all of them, I’d never run out of ideas for what to photograph when I want to spend a day behind the lens. The Scouting pages are back to the 90-degree rotation and include slots for type, location, description, highlights, cost, permits, contact information and notes. The arrangement on the pages seems like it could be a little better, as the Notes space is the full height of the form and only about one and one quarter inches wide. Immediately following the 20th page of location records, with no introduction or explanation, are twenty pages of dot-gridded memoranda pages. I prefer lines, myself, but this still is twenty pages of great note-taking space. Once again lacking introduction or explanation, the Memoranda section shifts to a sort of Resources section, beginning with a one-page Sunny 16 Rule cheat sheet that is extremely minimal in comparison to some of the simple printable exposure calculators floating around. The next, unlabeled, page uses pictograms to demonstrate the effects of aperture, shutter speed and film sensitivity (depth-of-field blur, motion blur and grain/noise). A title page then introduces the General Info section, which has lists of stock photography portals (no Getty, though), portfolio review events (another seemingly random selection), publications (mostly print magazines), and photo equipment and material suppliers (which, strangely, omits both Freestyle Photo and the Film Photography Project). The penultimate section, Chemistry, promises that each edition will feature a different variety of chemistry recipes. This edition is packed with formulae for 30 Ansco film and paper developers and replenishers, reprinted from Morgan and Lester Publishers’ Photo Lab Index of 1938. With study, I imagine it could be very informative about developer formulation in general. Finally, the About Us section is a 4-page quick history of Galaxy’s start and the Hyper Speed paper reversal process. The book ends abruptly on page 256, and the inside back cover features a nice expanding pocket for … whatever. I think the biggest problem with the product, now that’s arrived, is that it’s trying to be too many things at once. I would suggest that, in the future, photographers would be best served by breaking the Planner into several versions.One for large format shooters, one for roll film users, and one for the darkroom (including film and printing stuff) might be the best array. Film books should definitely get the Locating Scouting section, too, and the resources might fit well with the Darkroom notebook. Calendar sections and cheat sheets (though these could be more useful than they are) fit well in all. The Zone System instructions (in the sheet film book) and cheatsheets might work best as appendices rather than being at the front of the data sheets’ section. The resources sections could stand to be slimmed down through editing and typography. Speaking of typography, the layout is a bit schizophrenic. There are quite a few formatting inconsistencies that could stand to be addressed, such as choosing one paragraph spacing, one amount of paragraph first-line indent, and even typeface leading. Consistent use of title pages and formatting of listed items would help, too. Physically, I’d like to see the next edition printed on slightly heavier paper. Making the section title pages a nice 60- or 80-lb. paper with a tab sticking out might also be useful to a lot of photographers. The dimensions and overall construction are excellent and I hope they don’t change much in future versions. If the events and “General Info” sections’ lists are going to be included in future editions, they should be made more comprehensive and their formatting improved. My final word, though, is that the Galaxy Photographer’s Planner and Handbook is really a brilliant product with a ton of potential. I can definitely see myself ordering next year’s edition, as long as it’s actually here in time for the year to begin. I’d love to have a line of these loaded with notes and details on a shelf ten years from now. 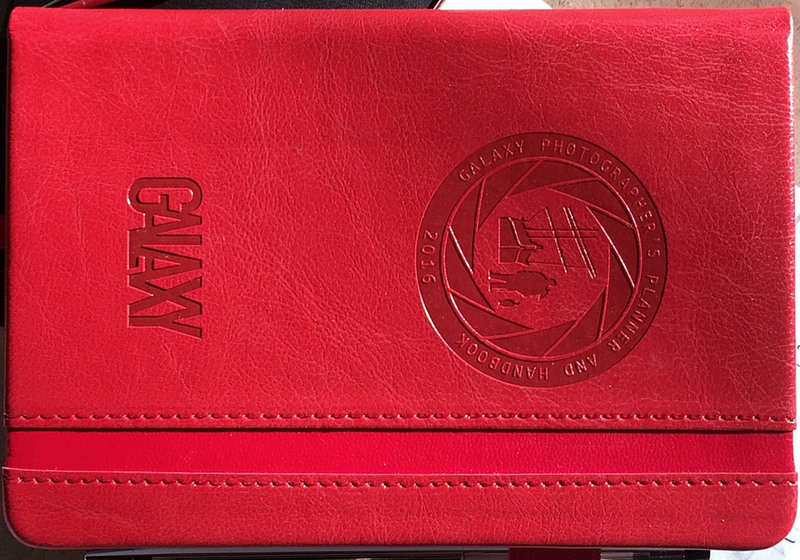 I backed the project for US$35 and got the planner, plus Galaxy made a $5 donation to the Antarctic Heritage Trust. You can get your own 2016 Planner from Adorama if you missed the Kickstarter campaign.